I got a requirement from one of my clients to create a customer portal. It was my first experience with portals, so I decided not to build a custom website but to install and configure Customer Portal. I won’t explain how to install and configure this solution – it is well described. Once it was configured, I had a phone conference with my client. The first requirement and main challenge for me was to remove the LiveId authentication and replace it with another authentication. 6. Clean and build your website. Честно говоря, недолюбливаю Customer Portal с момента его появления, возможно, что сейчас его сильно переписали. Хочу несколько дополнить приведённое решение. Тогда уж надо всё взаимодействие с сервером пускать по TLS-каналу. Также является плохим тоном хранение пароля в открытом виде. Как минимум его надо хэшировать (ещё лучше вместе с каким-то другим секретным значением, например, так: http://crrm.ru/articles/2010/03/secure-pass-storing-in-mscrm). В идеале, я бы порекомендовал написать собственный Membership-провайдер (а если требуется, то и Role-провайдер). Это не очень сложно, но позволяет использовать всю мощь провайдеров в ASP.NET (быстрое встраивание, встроенный механизм восстановления паролей). Переписать можно всё 😉 Вопрос в необходимости и в том заплатят за это или нет. Насчёт хранения пароля в открытом виде не спорю, безспорно лучше использовать хеш вместо самого пароля, но на это опять таки необходимо время и переработка кода и не мне вам объяснять то, что донести новые сроки и стоимость до бизнеса зачастую является тяжёлой, кропотливой, а зачастую и напрасной задачей. I have followed your blog and deployed the customer portal. While giving user name and password in the login page it is again redirecting to the same page and unable to access other pages. But it successfully authenticated and I can see last logon time in the CRM contact page. But it is not redirecting to other pages. Please help us to get the solution in this issue. Not sure what's wrong. Portal works fine for my customer. Hi,I have followed your instructions and successfully deployed the customer portal. But I've the problem, that there is no password field in my contact entity (http://4.bp.blogspot.com/-5zZo7gBHWT4/UPmZ5_NuriI/AAAAAAAABp0/xdy7KdUWRXw/s1600/1.png). Have you any suggestion for me, to solve this problem? Hi, i managed now to add the missing field, but I still not able to Login. The best way as for me is to attach with VS to your customer portal put breakpoint and get an answer why solution doesn't work. 1.I need to replace contoso logo . 2.when i'm clicking on some links it shows the messages "like You do not have sufficient permissions to view this page"
i got the solution for logo replacement . Glad that you've solved your issue! unfortunately VS displays no error or something else. I used the portal files from your ZIP-archive, but when trying to log in, I get the error. VS can detect compile-time errors but not run-time. To solve your issue you will have to using VS attach to IIS process (w3wp.exe) and put breakpoint to method Login1_Authenticate. Then you should try to authenticate and breakpoint should be reached. Then you will have to go line by line with debugger to find the reason of error you are getting. I'm trying to install my first Dynamics install but i've got a ridiculous problem : How to build the custom package to impot it into Dynamics ? Not sure what do you want to do… Can you please explain what do you want to achieve? I'm a rookie in Dynamics CRM 2011 and just use the system as simple as possible, on-premise version (we use Action Pack licences). I try to install the Customer Portal but i need that the authentication to use the "contacts" instead of on Windows LiveID or AD. i import the Customer Portal solution in my Dynamics Organisation and modifiy the web files with your instructions. Hello, I got your issue. 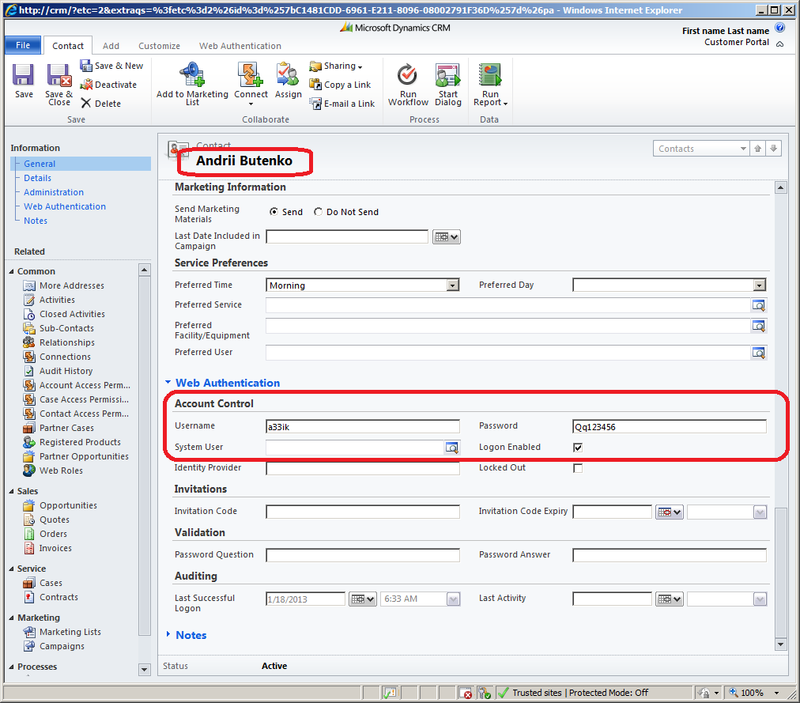 You should activate your portal using websitecopy – this will create required records in CRM. Thanks for your help ! You've got it ! Sorry, don't take care about my last post, i use the wrong sources for the website. It seems that you've found error in the code 😉 I'm not ideal and I already fixed that issue on the customer's portal. I will update portal and provide updated version. OK… you know what ?… i've got a problem yet…hum… sorry.